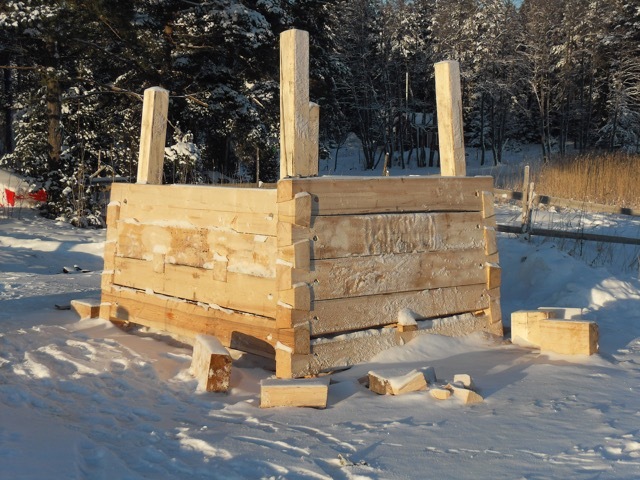 Strong, sustainable constructions can be made of horizontal logs with only a few simple tools. This kind of timber house tradition is long in the Nordic countries, Russia and the forested alpine regions of Central Europe. In Finland and Sweden all kinds of buildings from the simple log cabin to mighty churches and manor houses have been constructed in this way—the technique was introduced to America by Scandinavian settlers in the 19th century. The structural details have developed over the centuries together with the development of tools but it is important to know that all kinds of detailing have coexisted: finer handcraft in the dwellings than in the outbuildings and very fine detailing already in churches that date back to the early 17th century. The design of the corner notch and the tight fitting of the logs on top of each other is the key to success: draught free walls of solid wood give a comfortable indoor climate even in the severe Nordic climate. As the discussion goes wild about zero–energy construction, still today many old log houses will be wrapped in mineral wool with devastating consequences. It is every architect’s, conservator’s and engineer’s duty to inform clients and authorities of the threat this presents to historic structures. 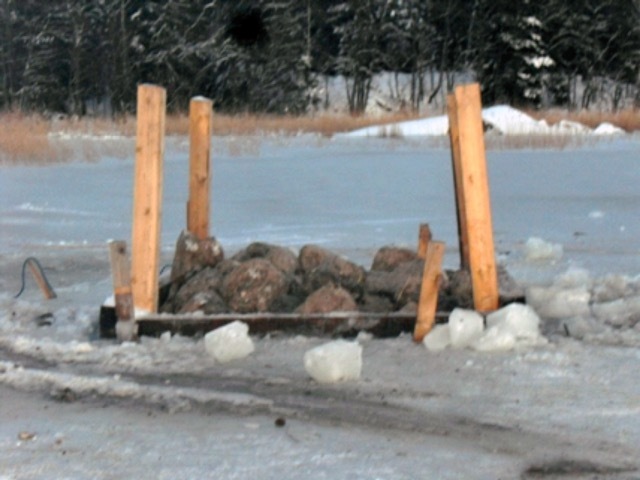 A traditional Finnish jetty or small bridge is founded on one or several boxes made of logs which are filled with stones. The boxes stand on the seabed and are high enough to support the deck. They are built on land during the autumn with dovetail corners and ties of timber across the inside of the box. When the sea freezes in winter the boxes are transported to their correct position on the ice. A hole is then made in the ice in the exact position for each foundation. Ice flakes are removed from the water and the boxes are pushed to float in their destined position. Then they are filled with stones until they sink onto the sea bed. The ice around the box naturally makes work easier. This technique makes strong and stable foundations that will last for decades despite storms and pressing ice. The wooden parts which are well under or well above the water deteriorate very slowly. But the logs that are situated at the changing water level will start rotting as they are exposed to both oxygen and moisture. However, sturdy logs last decades even in such conditions. 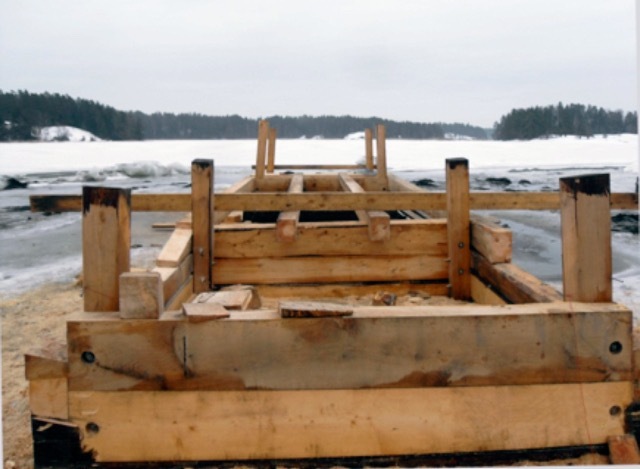 Traditionally Finns take advantage of the icy climate when building a jetty. Photos by Alexander Biström.